Last weekend was the orientation for the Washington Association of Black Journalists’ Urban Journalism Workshop. A fresh group of eager, young and bright high school students from the Washington, D.C. metro area came to National Public Radio to meet their section leaders and mentors and to embark on a journey exploring the ins and outs of the journalism field. The section leaders and mentors are mostly professionals who have been in the journalism industry for years. I’m one of the few college students that volunteer for the workshop. In fact, I was the only college student mentor present at orientation. It is my third year volunteering, and I look forward to another year of mentoring the youth and working alongside the professionals. If this program were available to me and if I knew wanted to pursue journalism while I was in high school, I would have applied to this workshop. It is an incredible opportunity for high schoolers to get hands-on experience fairly early. Over the course of eight weeks, the professionals teach them the fundamentals of journalism while the students form story ideas and produce news. Depending on the section they are assigned to, they either write articles for print, produce packages for radio or produce packages and a newscast for television. Participating in the UJW provides a clear advantage for the students over their future college classmates. 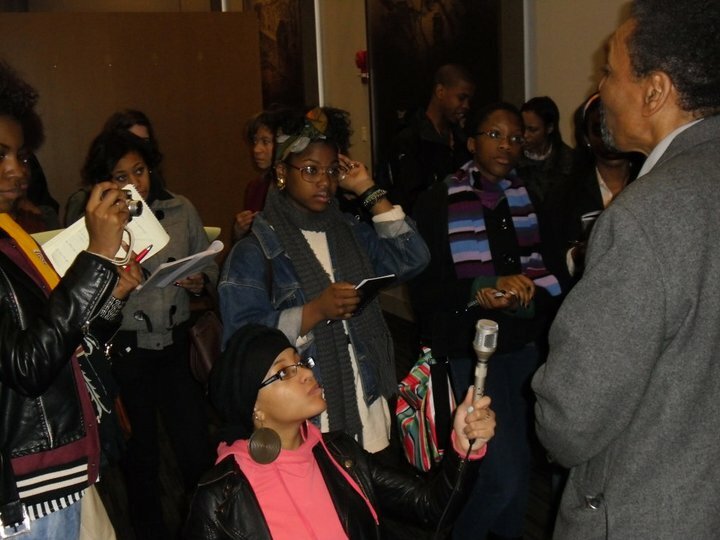 While attending high school, they experience aspects of journalism that college students do not experience until their sophomore or junior years unless they join extracurricular groups such as the campus newspaper, radio or TV station. Prior to entering college, UJW students already know how to deal with ethical issues, and they know how to stay informed on what is happening in the world — an integral part of being a journalist. They have had news quizzes every Saturday over the eight weeks of the workshop. They will not be the students with their feet in their mouths when they receive their first news quiz in their introductory journalism course. These students will also know the technical aspects of journalism before they enter their first year of college. They will know how to shoot and edit video, record and edit audio and take pictures using equipment comparable to that of college facilities. Writing is a necessary skill to master regardless of the career field one pursues, but the UJW students will know how to to write correctly for their respective platforms. Beyond the workshop, they will most likely master how to write for all platforms and be skillful enough to flawlessly change from broadcast to print style and vice versa. Most importantly, these high school students already have the right attitude towards learning journalism. Right from the first day, they came in motivated, driven and even prepared. Some of the students that I have met have already anchored newscasts and shows at their high schools, edited their school newspapers and are knowledgeable of current events. I cannot speak on behalf of all college journalism students, but some at the institution I attend are not on top of their game. I admit, I’m not doing enough in regards to pumping out content and doing enough internships, but when it’s time to graduate and compete for jobs, the individuals who participated in the UJW and made the most out of their experience will be the ones beating everyone out for those competitive positions. I feel grateful and honored to be able to share some of my expertise and invest my time in the futures of these young journalists. I’m hoping I will be able to learn from them as they learn from me.